Map showing the Etruscan civilization. The Etruscan civilization was a culture in ancient Italy. The Romans named them Etrusci or Tusci. The Ancient Greeks named them Tyrrhenoi or Tyrrsenoi. The Etruscans named themselves Rasenna. The Etruscan Civilization is very old. It began in pre-history. When it was very powerful, it was in three confederacies (areas like modern states). These three confederacies were Etruria, Latinum and the Po Valley, and Campania. The Etruscans ruled Rome until 396BC. 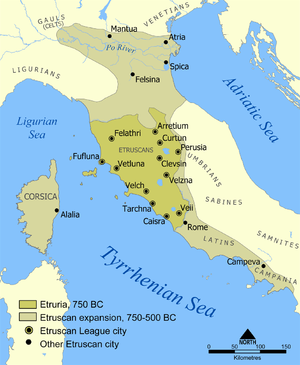 The Etruscan language is related to the Tyrrhenian language family and is not related to other languages. Some Etruscan letters were used by the Romans in the Latin alphabet, which English uses. When the Romans conquered the Etruscans, they wrote everything in Latin. So now we do not know much about the language. Some Romans wrote about the Etruscans and their language but it is now lost. This page was last changed on 25 July 2013, at 03:40.